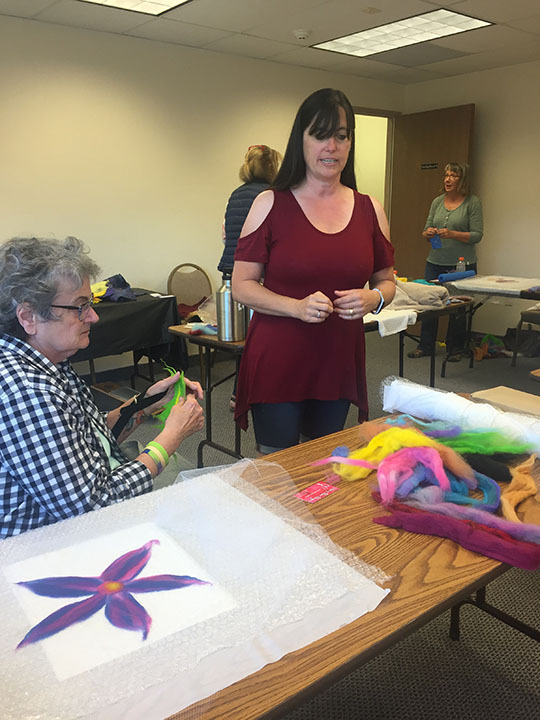 It was another fabulous day of fiber on day two of Sneffels Fiber Arts Festival. I put away my wallet today as today was a day for learning and teaching. 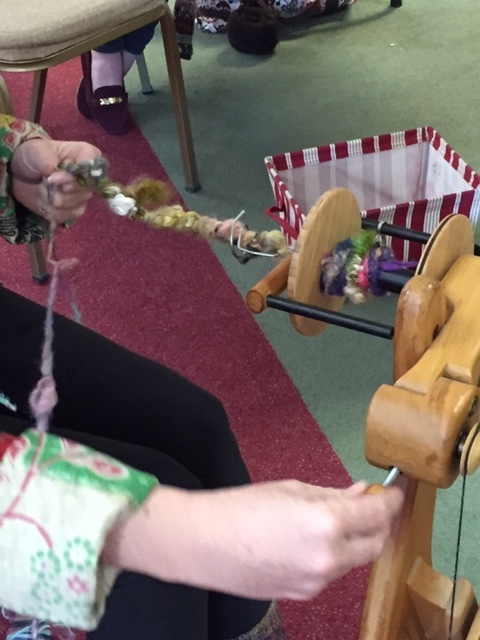 The day started out with a demonstration of Spinning Coiled Yarn by Joelle McCarthy of Corn Creek Fiber. 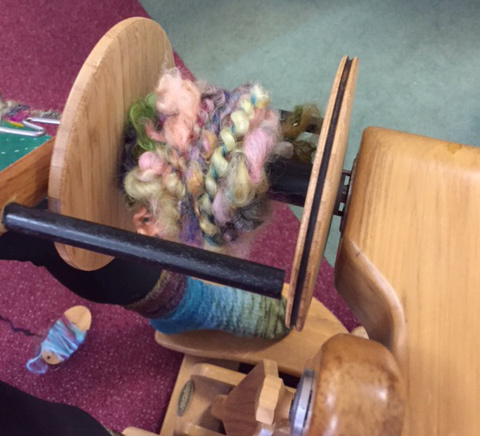 She demonstrated on some of her beautiful lock spun yarn and then she coil plied with mohair yarn in the center. In the end she made this beautifully textured yarn that would be a wonderful art yarn just by itself or to use it in one of her projects as an accent. This would join wonderfully with the Freestyle Weaving demonstration I saw yesterday. Now I have lots of new things to work on this winter. Then the afternoon was all about teaching. 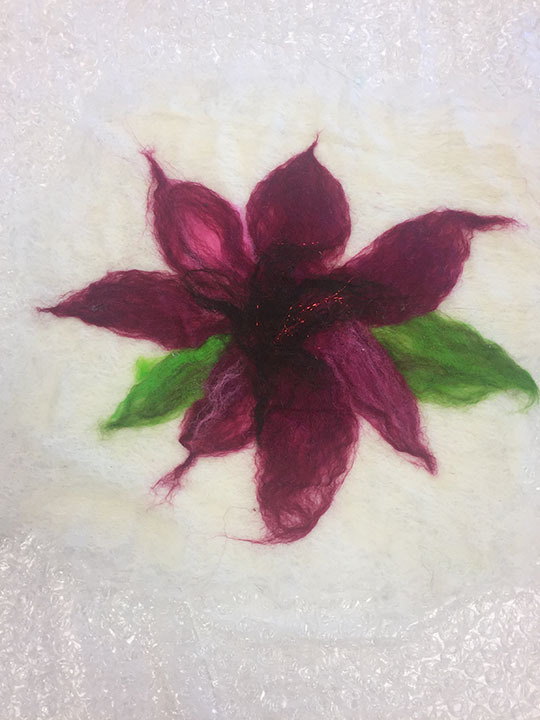 I had four lovely ladies join me in my Wet Felting Flowers class. We only had three hours so it was a bit fast and furious. 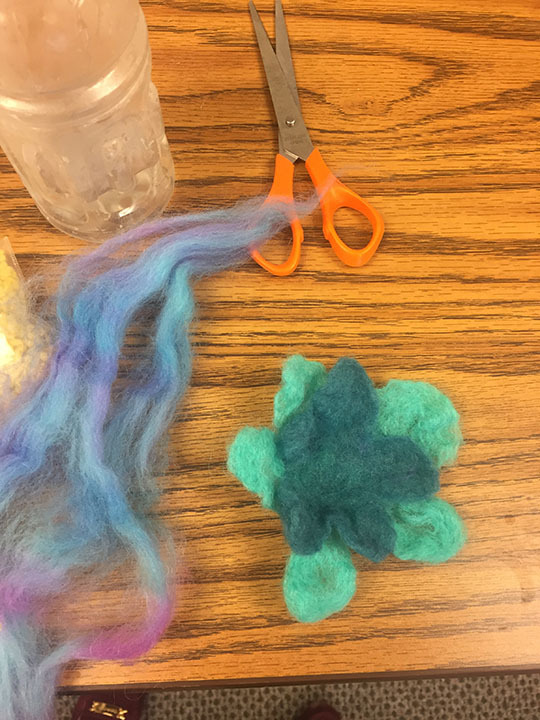 We jumped right into the basics of handling fiber and then making basic shapes like balls and spears. I also explained how to cross hatch the fibers to give them more strength. 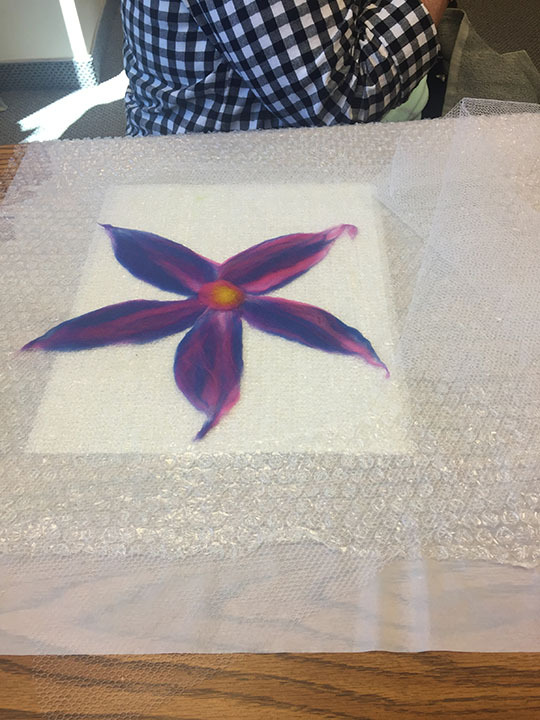 Then I sent the ladies off to start picking what colors they wanted to work with and we jumped right into making some flower shapes. It was fun to see how different each flower style was. Everyone finished a couple pieces and went home with lots of extra fiber to play with but when we were done “some” fiber is never “enough” fiber so we all headed downstairs and fo a field trip. With the help of my friend Pam Schultz all the ladies more fiber to felt with. We also found some great accents like silk, wool nepps, locks, and more. I had an awesome few days in Ridgeway, Colorado. I will never forget the views. You truly couldn’t look anywhere without seeing a spectacular view. At the last minute, Pam and I realized we hadn’t gotten a selfie together so we were blessed with another gorgeous view as a backdrop. It was great to have Pam in Ridgeway all weekend with me. We had some awesome dinners out together. It was nice getting to know her better. So sad I’m not going to get to hang out with her more since we leave the area on Tuesday. 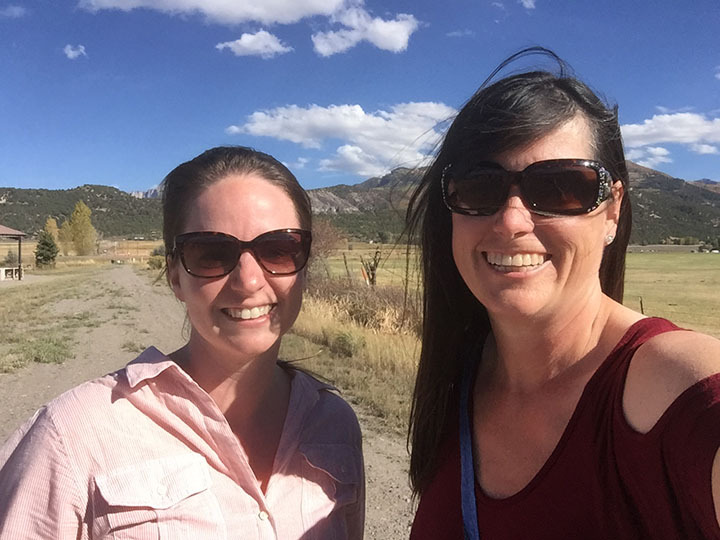 It has been an awesome summer in the Grand Junction area. 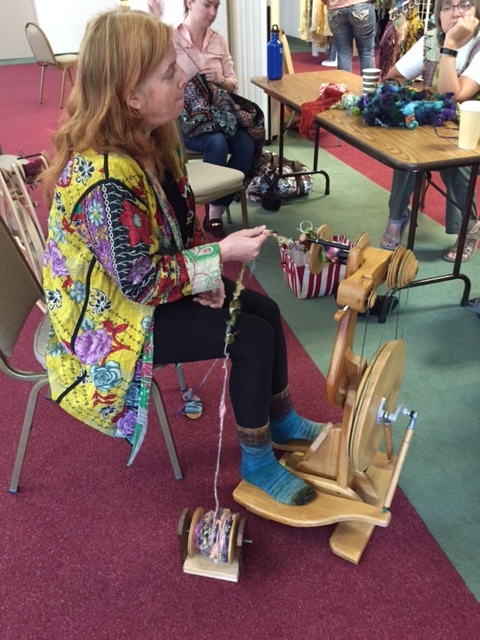 I felt very welcomed by both the Mesa Fiber Arts Guild and the San Juan Weavers Guild. 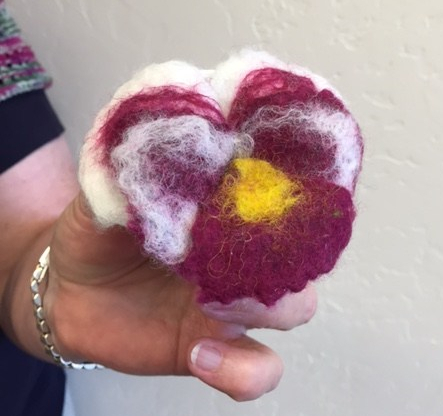 Not to forget the two awesome yarn shops in the area The Craft Studio & Yarn Shop where the couches are always open for a sit and knit and Spun in Palisade, a cute little cottage shop with the friendliest owner you will ever meet. If you are in the area make sure you visit these groups. You really won’t meet a nicer group of fiber friends.